Ava DuVernay accepts the Entertainer of the Year award onstage during the 49th NAACP Image Awards at Pasadena Civic Auditorium on January 15, 2018, in Pasadena, California. 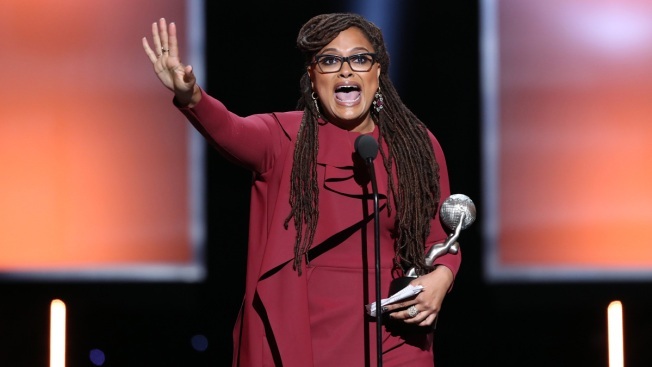 A jubilant Ava DuVernay was named entertainer of the year at an NAACP Image Awards ceremony that focused on the black community's power to create change. DuVernay lauded other black artists from the stage as she accepted her award Monday night, naming writers and directors such as Shonda Rhimes, Gina Prince-Bythewood, Kenya Barris and "Black Panther" Ryan Coogler. "This is our time," DuVernay said. "We can say we were here when all this gorgeous art was happening, and that we supported it — that we lifted each other up, that we did as Dr. King said we would do: Live the dream. We're the dream." Anthony Anderson hosted the ceremony at the Civic Auditorium in Pasadena, California, on what would have been Martin Luther King Jr.'s 89th birthday. While his politically tinged monologue poked fun at the presidential administration and Omarosa Manigault, others used their time onstage to encourage more civic involvement and the fight for social justice. Gal Gadot, Angelina Jolie, Margot Robbie and more hit the blue carpet at the Critics' Choice Awards. Producer Will Packer took a dig at President Donald Trump's recent comments about immigration as the producer accepted an award for "Girls Trip," which won for outstanding film. "Sisters, especially the ones from Haiti and Africa, we love you as your brothers," he said. Kerry Washington, Tracee Ellis Ross, Laverne Cox, Jurnee Smollet-Bell, Lena Waithe and Angela Robinson set the tone for the evening when they emerged onstage holding hands to dramatically issue a get-out-the-vote call. The six women declared support for the Time's Up initiative to stop sexual harassment and gender discrimination and urged viewers to speak up at the polls as well. "The midterms are a perfect moment for us to use our voices," Robinson said. "If we can take back a senate seat in Alabama..."
"Then we have the ability to shift the imbalance of power," Smollet-Bell said. 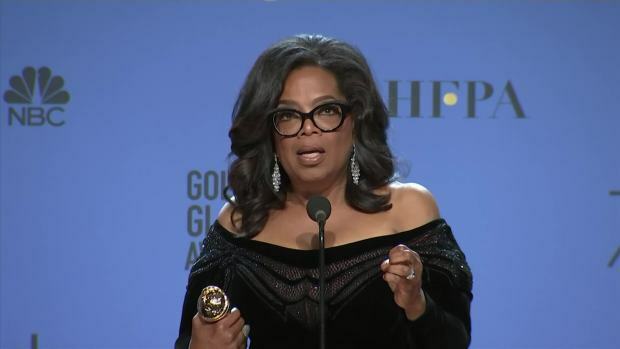 Oprah Winfrey speaks backstage after receiving the Cecil B. DeMille Award. Barris' show "black-ish" was the night's big winner. The ABC hit was named best comedy series and took acting honors for stars Ross and Anderson. "It's an extraordinary thing to be able to show what a beautiful black family looks like on television," Ross said as the cast accepted the comedy series honor. "Power" was named best drama series, and star Omari Hardwick won for dramatic actor. 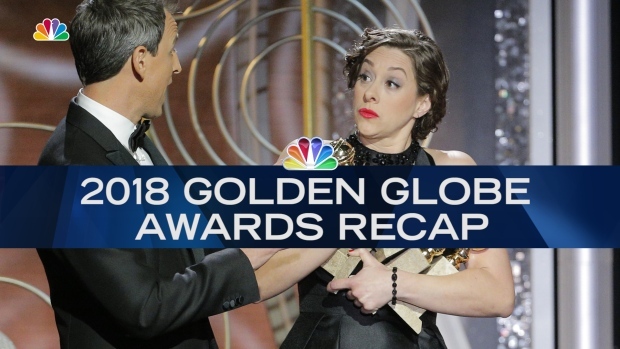 Other winners included "Gifted" actress Octavia Spencer and "Empire" star Taraji P. Henson, who were both absent, and Daniel Kaluuya, who won for his leading role in "Get Out." The British actor was clearly delighted at his victory. "I don't think you're allowed to beat Denzel Washington in acting competitions," said Kaluuya, who bested Washington for the prize. The 28-year-old actor thanked his mom and "Get Out" writer-director Jordan Peele. "So many people didn't believe in me, and you did, and you made all of us feel included," Kaluuya said. "Thank you so much for letting us be seen." NAACP president Derrik Johnson asked viewers to text in their pledge to vote in 2018 before presenting the President's Award to Danny Glover. Glover was recognized for his professional and philanthropic contributions, particularly his work with the United Nations and his advocacy for labor unions. Glover spoke specifically of a Nissan plant in Canton, Mississippi, where 80 percent of employees are black, that has yet to organize. "Civil rights and labor rights have always been one and the same," he said. The special awards provided some of the night's most poignant moments. Halle Berry talked about the significance of presenting the NAACP Image Awards on Martin Luther King Jr. day. "We need to take heed to his eloquent words: 'Our lives begin to end the day we become silent about the things that matter,'" she said. "Today is an affirmation that we will never ever, ever, ever be silent again." She presented the Music Makes a Difference award to Charlie Wilson, who talked about his road from addiction and homelessness to musical success and philanthropy. He said he prayed and promised that if he could survive the streets, he would return to serve others. Wilson said Monday that he has been sober for 22 years and is focused on helping homeless addicts. Labor organizer William Lucy received the Chairman's Award for his more than 40 years of service. Beyond his union leadership, Lucy was also an activist who fought apartheid in South Africa. He dedicated his award to the Memphis sanitation workers who went on strike in 1968, several of whom were in the audience at the Image Awards. King spoke to the striking employees the night before he was assassinated. Another arresting moment in the show came during singer Andra Day's chilling performance of Billie Holiday's "Strange Fruit." Rapper Common joined her for their song "Stand Up for Something," and the whole audience rose to its feet.